Learning is a life-long process and every day is a new beginning to learn something and transform our lives as a better individual. 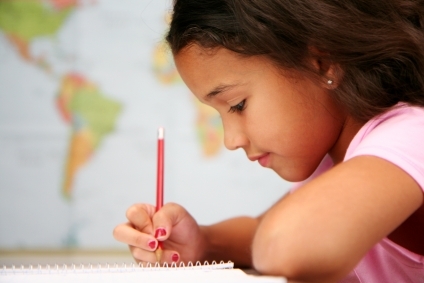 Even the vastu can help us to concentrate better and utilise our potential for education. Here are few Vastu tips to enhance the learning power and transform the lives of your children. Study room should be in the west, east or north zones of a house. The entrance of the study should be in north or east. Windows are preferred in the east direction. Study table should be placed in the east or north of the room. Keep an idol of Goddess Saraswati, on the study table or in north-east direction of the room. Avoid loads in the north-east and the centre of the room. The room should be kept clean and clutter free. Place the beds in the south-west area of the room and avoid bunk beds. Including the green colour in the colour scheme of the room is effective for enhancing the learning process. Make sure that the door leading into the room should not face a toilet or staircase. You can place a crystal gem tree, quartz crystals or amethysts in the west zone. Children should sleep with their heads towards south or east. This entry was posted in Vaastu and tagged blessings, children, concentration, direction, education, enhancing, faith, fortune, future, god, Goddess Saraswati, happiness, have a little faith, health, individual learning, learning, learning process, literacy, prosperity, shubhpuja, shubhpuja.com, studies, study rooms, study table, study tips, success, vastu shastra. 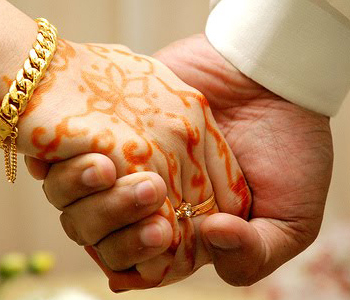 Marriage being an important and crucial affair in India is a tie-up between two families and commitment of love, care and belongingness. Imagine if this commitment or relationship is affected just due to disharmony among the placement of areas in the house; many of us might disagree with it but as per Vastu, the bed and bedroom are very important areas to maintain love and harmony of a relationship. Ideal place for bedroom is in the south-west, south, west or between north and north-west. Never have your bedroom in south-east zone as it causes frictions and clashes in relationship. It is recommended to use a queen size bed, without boxes and preferably with a ‘single’ mattress. You can also get the mattress stitched to appear as one or place a foam fitted sheet to cover the whole bed. The area under the bed should be kept clean and dust-free to avoid negativity in the room. Avoid shoes, slippers and etc inside the bedroom, especially under the bed. Prefer light and soothing colours in the bedroom to bring more love and understanding in your life. Avoid sleeping under a beam running lengthwise, to overcome this problem hang two crossed bamboo flutes from the beam facing downwards. A pair of doves or swans along with happy memories pictures must be displayed in the south-west corner of the room. The pointed objects like nails, iron spikes or sharp-edged furniture should not be pointed towards the bed. Dustbins and brooms must be out of sight. An L-shaped bedroom creates a sharp corner from the intersection of the two walls pointing across the room. Make sure that the corner is not pointing to the bed as the occupants would ultimately suffer from health issues. Do not keep an open mandir or create temple area in the bedroom. This entry was posted in Vaastu and tagged adjustment, auspicious, beams, bed, bedroom, beloved mate, commitment, devotees, directions of vastu, evil, faith, family, fortune, grace, happiness, harmony, have a little faith, health issues, Hindu, love, mandir, Marriage, mattress, negativity, relationship, room, shubhpuja, shubhpuja.com, success, vastu, vastu shastra. Home is the place where people spend their maximum time of their life; therefore our home should be the representation of our personality. The happiness and warmth of the inmates transforms the house into home yet a perfect house is also required to keep the inmates happy. So it is like a vice versa process. 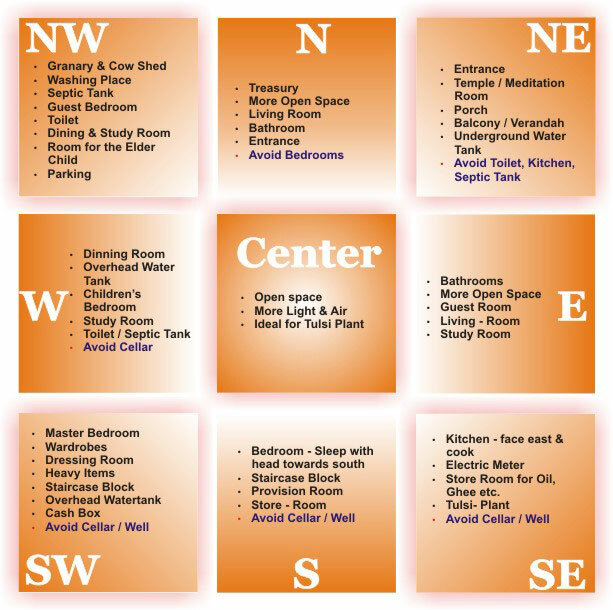 For restoring balance and harmony in the home, certain rules of Vastu should be considered, which are quite helpful during the planning and designing process of the house. Rooms should only be square or rectangular shaped, and not irregularly shaped. Kitchen, toilets and puja room should not be next to each other. Kitchen should not be directly in the front of the main door. Study rooms, treasury rooms and living rooms should preferably be in the north side of the house. Bedrooms and store rooms should be in the southern part, avoid bedrooms in the central portion (brahmasthan) of the house. Dining room, children’s bedroom and study room in the western corner of the house is considered appropriate. Bathroom, study room and stores in the eastern corner of the house. The stairs should not be made in north-east or brahmasthan, preferred location is in west, south-west or south. Have lofts and attics in the south and west side of the rooms. Puja room should be in the north eastern corner or it can also be inside the study room or dining room in the north-east corner. Rainwater or drainage should have an outlet in north, east or north-east side. Elderly people are more comfortable in the south-west corner of the house. The number of doors and windows should be more on the ground floor and less on the upper floors. Allow plenty of natural light and fresh air within the house, as dark houses collects a lot of negativity. There are certain dates when neither muhuratha nor auspicious time is required, so you can begin your construction or move into your house on Akshaya Tritiya, Phulera Duj, Vijaya Dashmi and Vaisakhi. This entry was posted in Puja, Vaastu and tagged ancestors, appropriate, auspicious, balance, blessings, consultation, designing, direction, divine, east, faith, family, fortune, grace, happiness, harmony, have a little faith, health, home, house construction, house planning, inmates, master bedroom, north direction, perfect planned house, pooja, positivity, prosperity, puja room, religion, rules of vastu, shubhpuja, shubhpuja.com, south direction, success, sunshine, vastu shastra, wealth, west, worship. 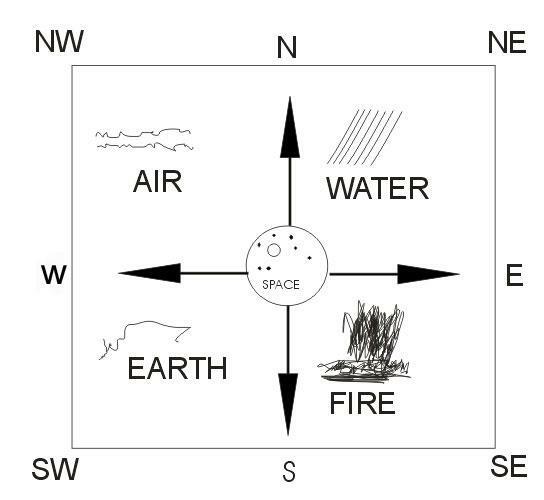 Vastu involves an understanding of the eight directions that includes four cardinal directions and four angles or vidishas. The centre part of all these directions is called ‘brahmasthan’. Every direction is unique in its own way and there is certain speciality of each of them, so according to their significance the house should be planned and constructed. East is the direction of family generation. Open space should be left in the eastern direction of the house while construction. West direction is capable of giving success, glory, fame and fortune. North is the place of mother. By leaving open space in north, the maternal side of the family prospers. South direction is responsible for wealth, success, happiness and peace. North-east zone is assigned to water. Appropriate for constructing borewell or underground tank. This sector gives stability to the family. North-west zone is assigned to air. It is good to keep finished goods in this area as they will move fast. It is responsible for relationships, friends and enemies. South-east zone is assigned to fire. Kitchen, pantry, furnace or boiler should be placed there. Zit is responsible for good health and healthy finances of the inmates of house. South-west zone is assigned to earth. This is the best area for master bedroom. It gives stability to the head member of the family. These directions cannot change the destiny yet it ensures the safety measures by creating a harmonious space and strength to bear the problems in life. It is like a free will to a person, where he decides what to choose or not. This entry was posted in Astrology, Vaastu and tagged 8 direction of vastu, air, auspicious, blessings, construction, directions, divine, Earth, east, energy, evil, faith, fame, family, fire, fortune, happiness, have a little faith, Indian, love, north, north east, north west, power, scientific relevance, shubhpuja, shubhpuja.com, significance, south, south east, south west, space, success, vastu shastra, water, west. What kind of Thumb do you possess? ‘The truth of palmistry could rest upon the solid foundation given by the study of the thumb alone.’ This statement defines the significance of ‘thumb’ in the domain of Cheirognomy and the complete palmistry itself. We often find cutting off the thumbs of the enemies during war, or of the prisoners for their crime. Even in the early days when prisoners were brought for justice in the court, they covered their thumb with their fingers- symbolising the giving up of his will and independence, and begging for mercy. 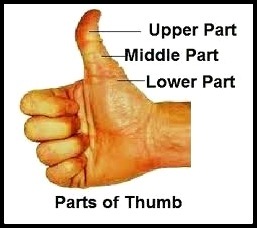 So let’s explore what kind of thumb do you have and what great powers favour you. First or Nail Phalange: When the thumb is unequally developed, the first phalange is extremely long and the holder possesses extreme ‘will’. Second Phalange: When the second phalange is extremely longer than the first one, the holder is logical and in spite of innovative ideas and skills, they lack the determination to carry it out. Third Phalange: When the third phalange is long and thumb is small, the person is bent towards passionate and sensual side, as it is the boundaries of Mount Venus i.e. love. 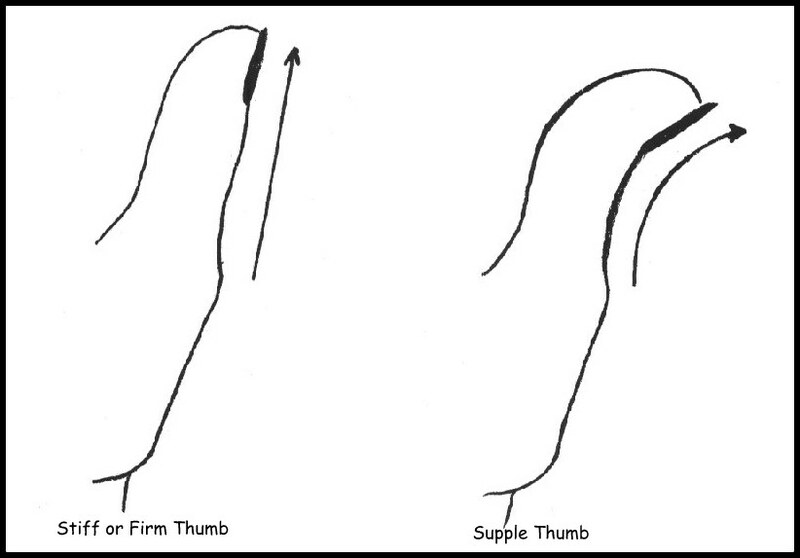 Another noticing factor is the flexibility or stiffness of the first joint of the thumb. When supple, the first phalange is allowed to bend backwards; when on the contrary, the thumb is stiff, the first phalange cannot be bent back. This is the symbol of extravagant nature, one who is natural spenders of wealth as well as thoughts. They are quite adaptable to new people and situations and settle down easily. These people are more practical and possess a stubborn determination which makes them strong. The stick to one thing and have their own thoughts of making the best in their own home and country. This entry was posted in Astrology, Palmistry and tagged attributes, blessings, divine, firm jointed thumb, flexibilty, happiness, have a little faith, hinduism, lower phalange- Mount of Venus, middle phalange- logic, palmistry, phalange, pooja, powers, puja, shubhpuja, shubhpuja.com, success, Supple jointed thumb, thumb, types of thumb, upper phalange-will. The unique study of Palmistry is divided into two major sections or sciences known as cheirognomy and cheiromancy. Cheirognomy is the branch that deals with the shape of hands and fingers, and cheiromancy deals with the lines and markings of the palm. The inter-related branches are incomplete without each other and correct predictions can only be done by thorough study of both the sciences. Have you ever thought that what is the shape of your hand and how the varied shapes of hands affects our thoughts, nature and even career. Here we will discuss the seven major types of hands, which may again be subdivided into further categories. The palm is thick and coarse with short and clumsy fingers, and short nails. Here the palm dominates the hand i.e. the animal nature prevails. These types of people possess little mental capacity and have a strong influence towards the order of brute. Violent and passionate in life yet their coward instinct prevents them to take risk. The palm is square at the wrist, square at the base of the fingers, and square shaped fingers. In fact the nails are also short and square. Such people are orderly, punctual and precise with great sense of discipline. They prefer reason to instinct, peace to war, and are quite methodical in work and habits. They are not adaptable to people, new ideas and have no interest in creative or art work. They disbelieve what they cannot comprehend. It is unusually broad at the wrist or at the base of the fingers, with the tips of each finger resembling the spatula. They are restless and excitable and never stick to anything for long. They are intense lover of action, energy and independence. This is like a hand of great engineers, explorers, scientists, navigators and mechanics; but not always. They possess an original way of perception and singular independence of spirit. The hand is long and angular, with bony fingers, developed joints, and long nails. Such people are humanity lovers and are quite distinct from the crowd. They are silent and secretive, deep thinkers and very careful over little matters. They are proud with the pride of being different; and rarely forget an injury yet bestowed with patience. Brahmans, Yogis and other mystic people like Jesuits of Catholic Church, often possess such hands. This is a medium sized hand, palm slightly tapering, and the fingers full at the base, or slightly pointed, at the tip or nail phalange. Main traits of such hand is impulse and instinct; the one in which love of luxury and indolence predominate. Though quick in thoughts and ideas, yet they are devoid of patience and tire easily. They do not reason, they judge by impulse and instinct and are good conversationalists. Possess generous, sympathetic and emotional temperament. The most beautiful hand, yet the most unfortunate of seven types is a long, narrow, and fragile-looking, with slender, tapering fingers and almond shaped nails. They have a pure visionary and idealistic nature; who have no idea about being logical or practical. They are easily influenced; and seem to dwell on the confines of spirituality, without knowing why. Thus in the worldly sense they are usually left behind in the race for fame and fortune. The mixed type is so called as the hand cannot be classified as square, spatulate, conic or psychic; the fingers also belong to different types- often one pointed, one square, one spatulate, one philosophical, etc. This is the hand of ideas, versatility and is generally of changeability of purpose. They are adaptable to people and circumstances, clever, but erratic in the application of talents. They find their greatest scope in work of diplomacy and tact. They usually become ‘jack of all trades’ and fail to possess the pure development. This entry was posted in Astrology, Consultants, Palmistry and tagged astrology, attributes, blessings, career, cheirognomy, conic hand, elementry hand, grace, hand, happiness, have a little faith, Hindu, Indian, knotty hand, logical, love, mixed hand, nature, palmistry, pooja, predictions, psychic hand, puja, rituals, Science, shubhpuja, shubhpuja.com, spatulate hand, sqaure hand, success, temperament. Realizing the importance of transforming phase within one’s life, certain traditions and customs are still performed in the present era. The transition from child to a youngster and then adult are best explained through the “Upanayanam Samskara” or “Janeu ceremony”. Literally Upanayan consists of two words, ‘Upa’- near and ‘nayan’- eye or inner vision; so this is a process of gaining inner vision through the guidance and learning of Guru. 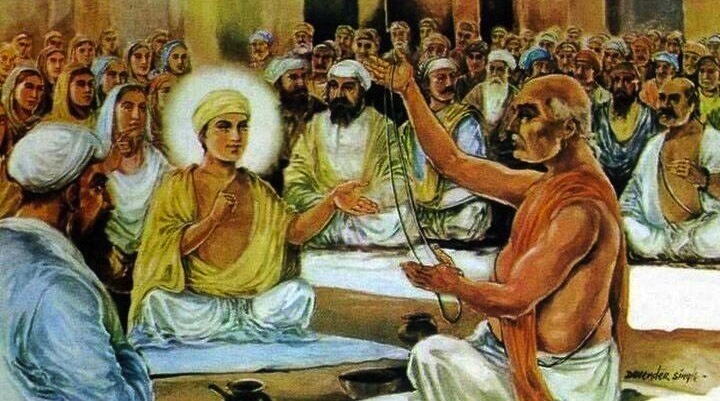 Initially this process or sanskar began after realizing the importance of learning and cultivating the passion for gaining knowledge from the Guru. Depending upon the varied religions and castes, different ages have been allotted for performing this ceremony yet the main motive behind this is to highlight the commitments made by one towards his studies or learning, by avoiding any kind of distractions. It is believed that every being is born the same and they further create themselves through karmas, so this process is similar to a second birth i.e. ‘dvij’, where one realizes the importance of their life and attains a motive. It also marks the beginning of a new life for the child as he attains the first most important lesson from his father or Guru, learning to recite Gayatri mantra. So here the child is believed to grasp the meaning and crux of the mantra, rather than parrot learning, and imbibing the positive vibrations while chanting it. The pious thread used in the sanskar ceremony is made up of nine fibres, which are Omkar, Agni (deity of fire), Nag (serpent), Som (moon), Pitar (ancestors), Prajapati (deity of procreation), Vayu (air), Yama (deity of death) and Vishvadevata (deity of the universe). “He who sees all creatures in himself, himself in all creatures, does not show abhorrence to any one; knowing all beings to be one’s own-self and seeing the unity of man-kind, how can there be for him delusions, sufferings and sorrows”. These lines from the Upanishads sums up all and provide a direction to the being in this material illusionary world. This ceremony aims at providing the attributes of love, compassion, benevolence, discipline and valuing human relationships. In the modern education, the light of values and morals is diminishing so to preserve the brightness of moral values, it’s necessary. The wearer of this sacred thread also learns the main goal of his existence and keeps himself engrossed on the path of divinity, avoiding disturbances and turbulence. This entry was posted in Mythology, Puja and tagged ancestors, astrology, auspicious, blessings, boyhood, celebration, commitments, devotees, dharma, divine, energy, faith, family, Festival, gayatri mantra, god, Goddess, happiness, have a little faith, Hindu, hinduism, janeu thread, knowledge, learning, Mantra, pooja, puja, religion, rituals, scientific relevance, shubhpuja, shubhpuja.com, significance of janeu, strands, traditional values, trinity, upanayanam sanskar, worship.